'Incendiary kite as serious as mortar shell. Kite in Gaza area like missile on Ashkelon' said Justice Minister. 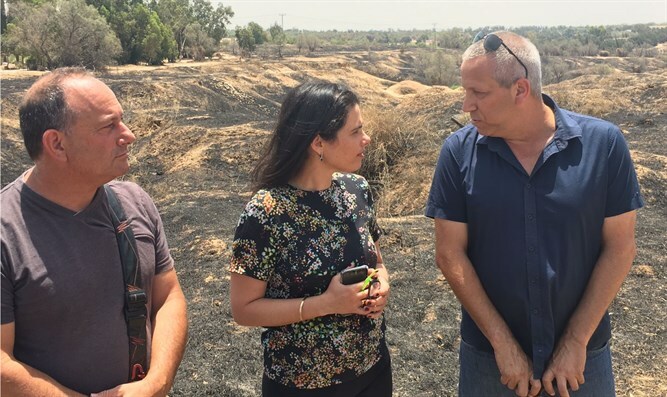 Justice Minister and Political Security Cabinet member Ayelet Shaked (Jewish Home) today toured Gaza area communities in the Eshkol and Sdot Negev Regional Councils whose fields were burned by Gaza Arabs launching incendiary kites and explosive devices. During the tour Minister Shaked heard a security briefing on threats from Gaza. Shaked entered a terror tunnel that crossed the Israeli border at a junction that splits into subsidiary tunnels. Shaked also visited fields destroyed with kites and firebombs, and saw the construction site of a new education complex in the Eshkol region. Minister Shaked heard from council heads and Kibbutz Sa'ad and Alumim residents about problems faced by residents in the past two months. One resident told Shaked about residents' feeling insecure: "Even a daily children's task like taking the dog for a walk has become impossible; the government must eradicate the phenomenon," he says. Council heads spoke of the government's not encouraging establishing new settlements. Farmers explained the challenges to agriculture in the region. The Justice Minister said during the visit to the south that "An incendiary kite is no less severe than a mortar shell. A kite in the Gaza vicinity is like a missile on Ashkelon. The State of Israel is committed to striking with an iron fist against those who launch burning kites and terrorist operatives. "Gaza area residents are strong and determined, and the fact is that the number of residents increased significantly since Protective Edge. Farmers cultivate their land despite the fires and we as the government must help them with what's possible. Agriculture isn't only an economic industry, it's a basic Zionist value in building the country," emphasized Shaked.